Ammonium phosphates are inorganic salts derived from the reaction between ammonia and phosphoric acid. They are produced as solids and fluids and they may contain phosphate values in ortho- (usually solid) and/or polyphosphate (usually fluid) form. The vast bulk of ammonium phosphate products are produced and consumed as solid materials. Ammonium phosphates are consumed primarily (almost 98%) in fertilizer applications, although minor amounts are used in animal feeds and industrial applications. The leading industrial applications include fire control and flame-retardant applications. Animal feed and industrial applications combined consume less than 3% of total world apparent consumption. The bulk of both diammonium phosphate (DAP) and monoammonium phosphate (MAP) capacity is located in China, accounting for about 38% and 46% of total global capacity in 2016, respectively. World capacity for all solid ammonium phosphates grew at an average annual rate of 3.5% during 2000–16, and is forecast to grow at 2.2% annually during 2016–21. The United States had the largest capacity until 2007, when it was surpassed by China. In 2016, China accounts for almost 42% of total global capacity and is forecast to account for slightly more than that in 2021. The next five largest producing regions combined account for 49.6% of the total capacity in 2016. Chinese capacity is forecast to grow at 2.3% annually during 2016–21. Major capacity increases occurred in China during 2011–16, while capacity reductions occurred in the United States, Eastern Europe, and Japan. During the forecast period, China is projected to have the largest gain, followed by the Middle East and Africa. 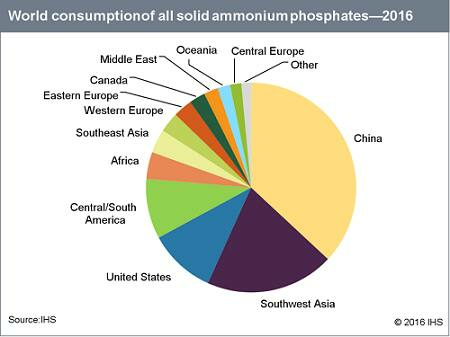 China is also the largest consumer of ammonium phosphates, accounting for 37% of total world consumption in 2016, followed by Southwest Asia, the United States, and Central and South America. The highest consumption growth rates are expected in Central and South America, Eastern Europe, and Africa, which are forecast to grow annually at about 4.5%, 3.5%, and 3%, respectively. Global consumption of ammonium phosphates is driven by population growth and strongly influenced by general economic drivers. Apparent world consumption of all solid ammonium phosphates grew at an average annual rate of 3.5% during 2000–16. Through the forecast period, total consumption is forecast to grow at 1.8% per year. Apparent world consumption of DAP grew at an average annual rate of 2.1% during 2000–16, and is forecast to grow at 1.7% annually during 2016–21. All regions will continue to have growth except Western Europe and Japan. Apparent world consumption of MAP grew at an average annual rate of 5.6% during 2000–16, and is forecast to grow at 1.9% annually during 2016–21. China, Central and South America, and the United States are the largest consumers of MAP. Combined, these regions account for more than 75% of total world MAP consumption in 2016. All regions will continue to have growth except Western Europe, Japan, and Southwest Asia.